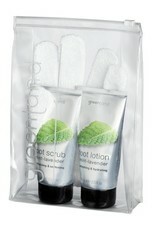 Home / Fuit Emotions, giftset: footcare, mint-lavender, foot scrub en foot lotion. A complete foot care set! With these products nurtured and fresh feet are assured! 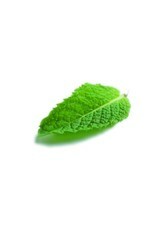 The scrub and lotion contain the essential oils of peppermint and lavender. 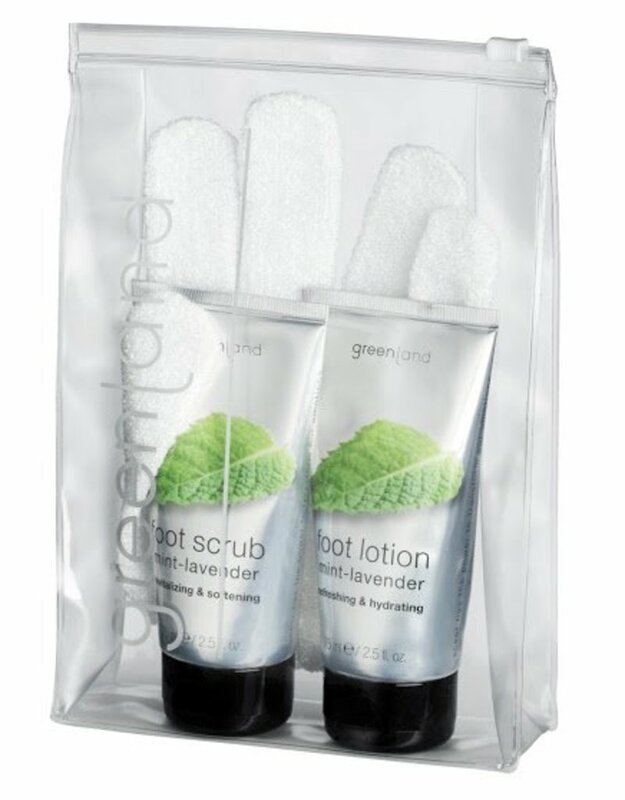 The foot scrub and scrubbing glove polish the skin and will result in silky smooth feet while the foot lotion will keep the feet fresh for hours. Just Emotions! Wet the feet and apply the desired amount of Greenland Fruit Emotions foot scrub to the feet. Rub the scrub in properly and then rinse the feet thoroughly with lukewarm water. After scrubbing apply a generous amount of Greenland Fruit Emotions foot lotion to the feet and rub the lotion in thoroughly. Ingredients foot scrub: Aqua (Water), Stearic Acid, Glyceryl Stearate, Ethylhexyl Stearate, Cetearyl Alcohol, Glycerin, Menthyl lactate, Cyclopetasiloxane, Mentha Avensis Leaf Oil, Sodium Cetearyl Sulfate, Parfum, Phenoxyethanol, Ethylhexylglycerin, Limonene, Linalool. Ingredients foot lotion: Aqua (Water), Cetearyl Alcohol, Ethylhexyl Stearate, Glyceryl Stearate, Stearic Acid, Glycerin, Phenoxyethanol, Cyclomethicone, Menthyl lactate, Sodium Cetearyl Sulfate, Ethylhexylglycerin, Parfum, Mentha Avensis.